This version of Spider-Man from Hasbro’s The Return of Marvel Legends Wave Two is the Future Foundation variant of the regular or “Big Time” Spider-Man figure. 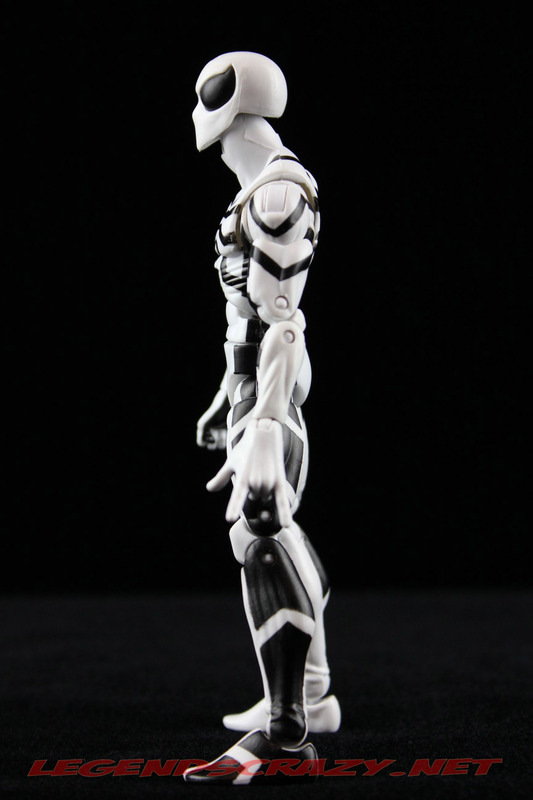 The Future Foundation was created by the remaining members of the Fantastic Four, shortly after Johnny Storm the Human Torch’s death. Reed Richard’s organized the philanthropic group to better serve humanity’s future by training the brilliant younger members of the group in how to come up with solutions to the world’s problems. 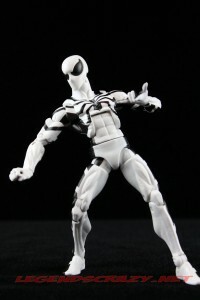 Spider-Man was asked to join the three remaining members of the Fantastic Four in training the younger members of the Future Foundation. It was later revealed that Johnny Storm was alive after all and the original members of the Fantastic Four regrouped. The costume Spider-Man wore during his tenure in this team was made of unstable molecules by Mr. Fantastic. 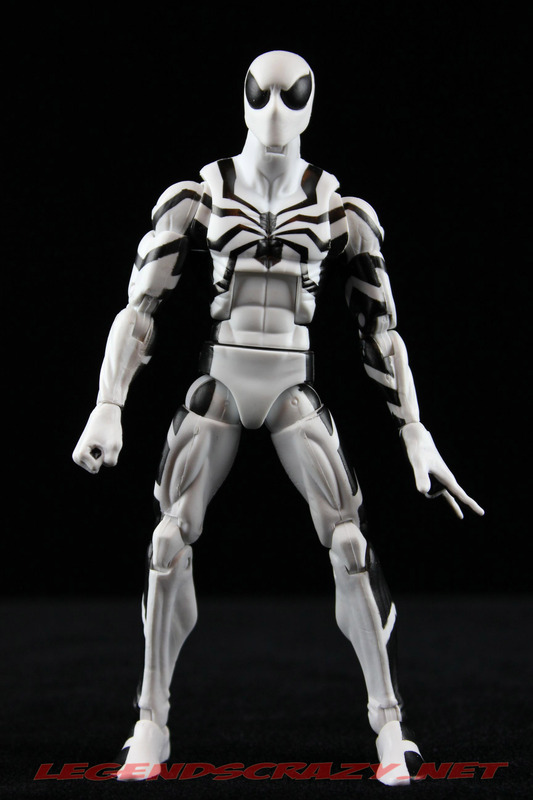 I really like the look of the black on white costume of the Future Foundation Spider-Man. 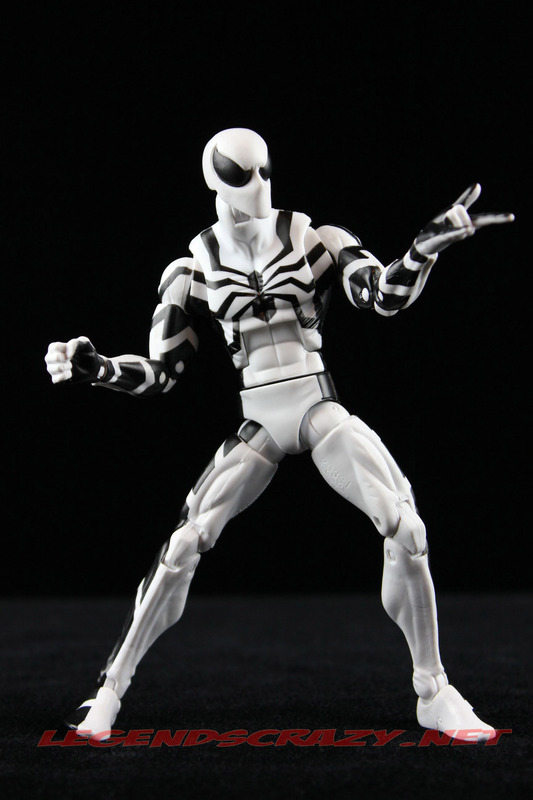 It is the second figure in this wave to sport this look. 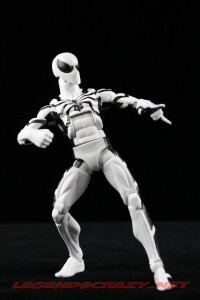 This figure uses the Quicksilver buck once again with the exception of new feet and the addition of everyone’s favorite bit of articulation: rocker ankles! 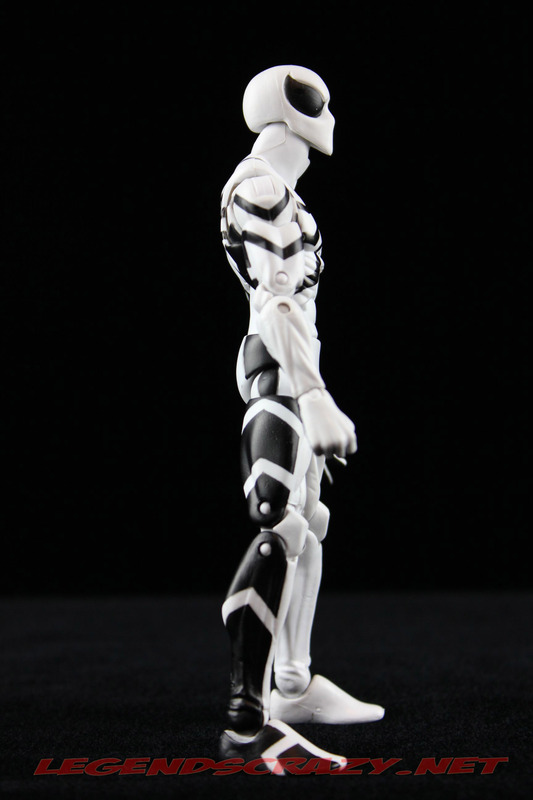 The paint lines on my figure are pretty sharp for a mass production action figure. 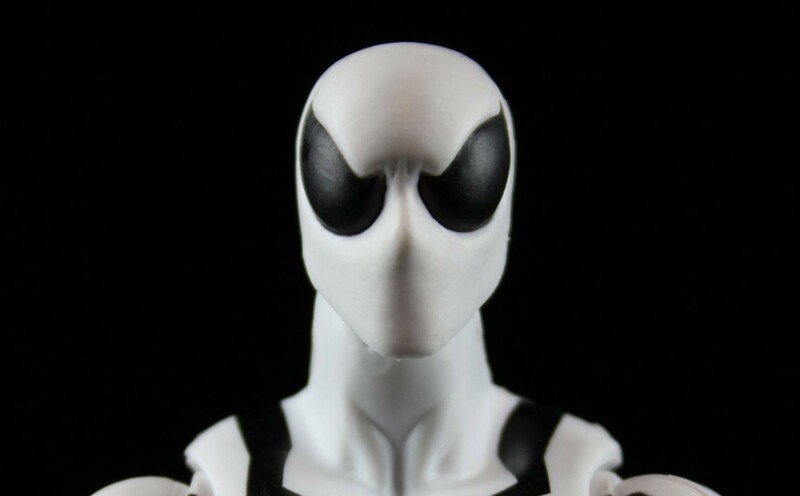 The eyes are very large but do not have the pupils painted on as he drawn in the comics. 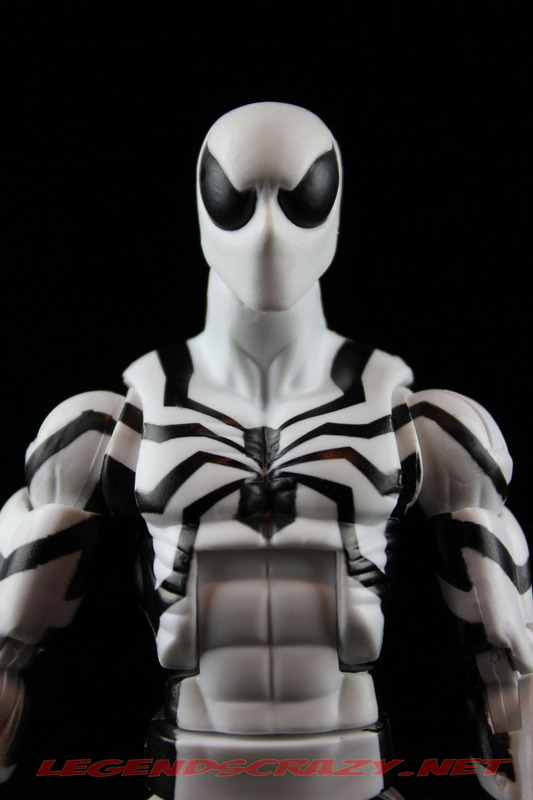 The top part of the spider emblem on both his chest and back are slightly off-center on mine and the top and bottom parts of the emblem don’t touch. I can live with that, but I am already starting to see some chips in the black paint around the shoulder extensions. This was a pretty involved paint app, especially for Hasbro, so I’m actually surprised to see that he came out as well as he did. There is plenty of articulation in this buck to do a character like Spider-Man justice in the poseability department too. This Spider-Man has a ball-joint head and hinged neck, ball-joint shoulders and hips, double-pinned elbows and knees, hinged swivel wrists, the shoulder extensions, an ab-crunch, cut waist, and hinged rocker ankles. 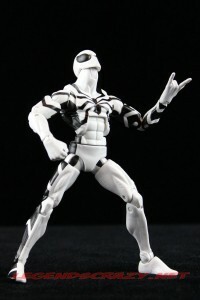 He has one hand sculpted in a fist and the other is sculpted in his trademark web-spinning pose. 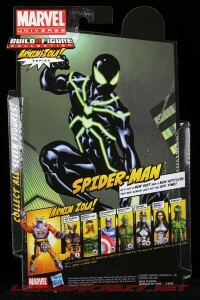 Spider-Man comes with no accessories and also has no Arnim Zola Build-a-Figure part. That will probably make him a easy pass for some collectors. It’s a pretty decent Spider-Man in all though. 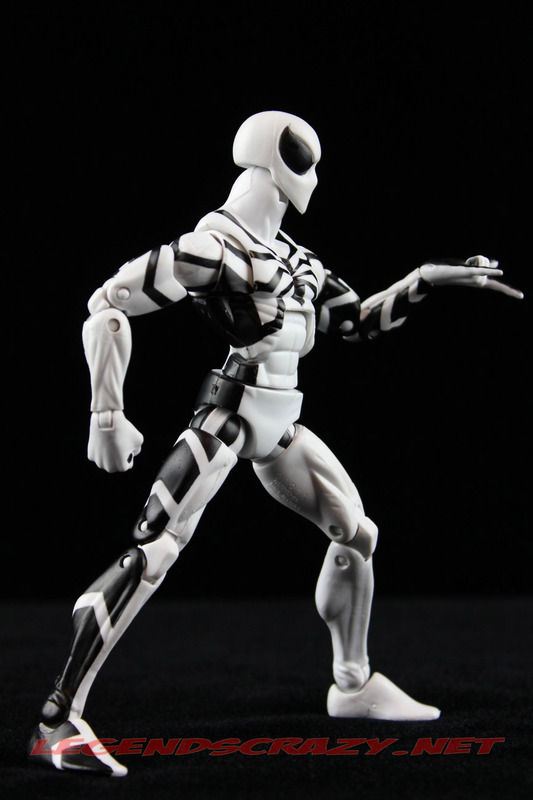 I think a slightly thinner build would have worked better for him but the extra points of articulation makes that a little easier to overlook. 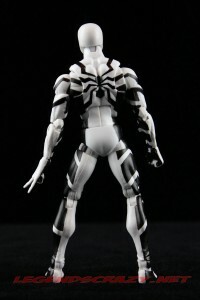 I still haven’t been able to find the regular or “Big Time” version of Spider-Man. 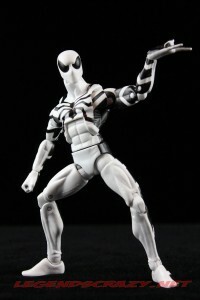 From what I understand from reading the collector forums is that he’s pretty hard to come by at this time. I’ve seen a few e-Bay auctions lately where he has sold for $200 to $350. That; Ladies and Gentleman is crazy!!! It’s possible he could end up being as rare as the Toy Biz Toad and others. There is speculation that Hasbro pulled him from production because the paint apps didn’t turn out as they had specified to the factory. There is speculation that he was very short packed in these initial shipments because of some other problems. 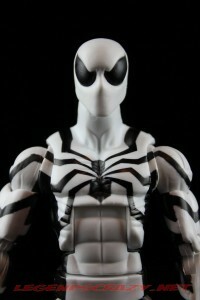 Tt’s all speculation though, as there has been no official word from Hasbro. I am hoping that in the rush to get Avenger’s product shipped before the première of the movie, there was some mistake that will be fixed and we’ll see more cases of both wave one and two shipped out again in the near future. 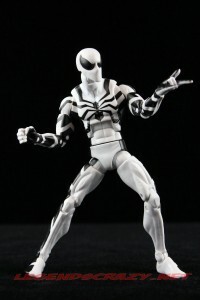 There is going to be too much time between the second and third waves for there to be no Marvel Legends in the retail stores for that long. From the pictures I have seen on-line of the ones that are out there, he really doesn’t look anything like the promotional pictures Hasbro showed before the wave was released. 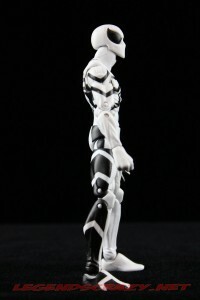 I am a completest, so I would like to have one but, I won’t pay those kind of prices for any 6-inch action figure. Has anyone else found the “Big Time” version yet? Are you seeing a lot of them, a few of them, or haven’t seen one yet either? Marvel Legends Returns in 2012!!! 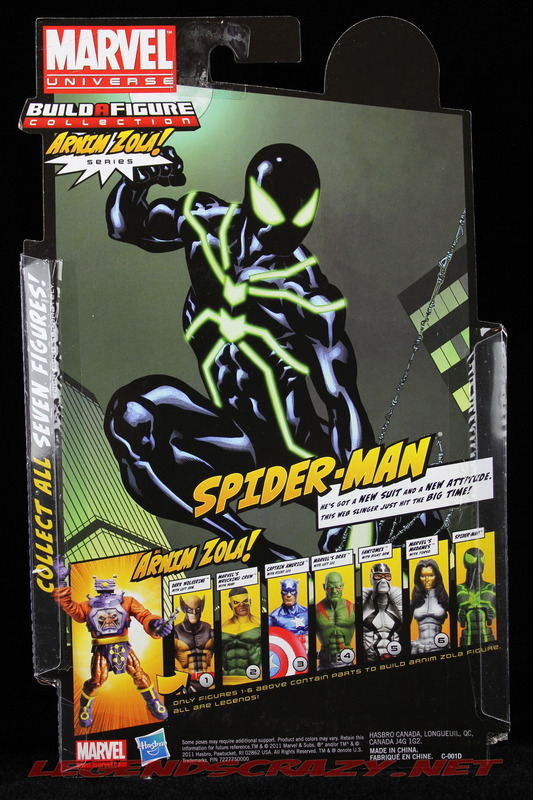 DCUC Wave Six is in the U.S.! 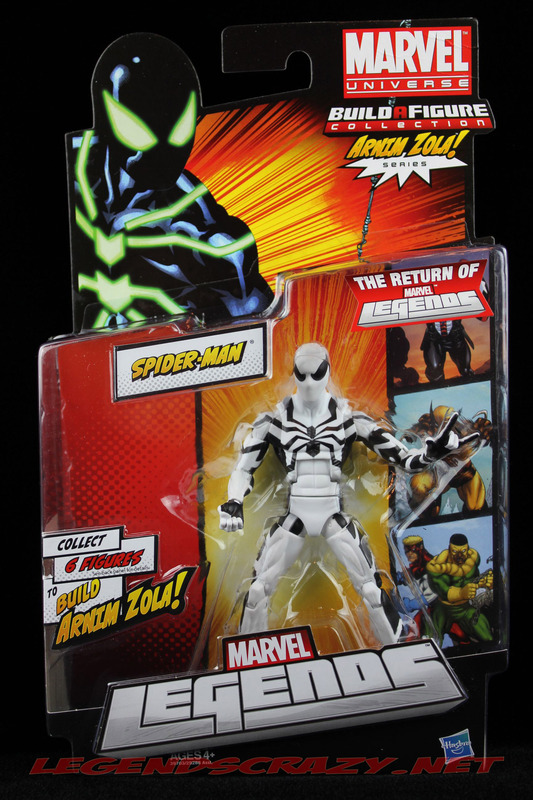 The Return of Marvel Legends!